Jill Gardner is getting Coffee, Books and More in South Cove, California ready for Mother’s Day with a large selection of greeting cards from which her customers can choose. One customer in particular is having a hard time picking a card. Kyle Nabor needs a card for a mother he hasn’t seen since he was a child, and Jill goes above and beyond to help him. Jill is also nervous about the upcoming holiday because she will be meeting her boyfriend Greg’s mom for the first time. 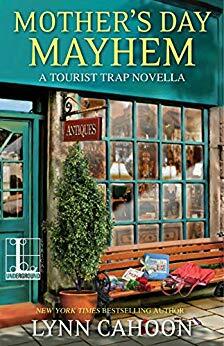 Mother’s Day Mayhem is a novella that is part of the Tourist Trap Mystery series. I’ve read some of the other books in this series, but because of the format of this series, new readers can join right in and not feel like they need to have read the prior books. This story is a little different than most of the books in the series in that it’s not a murder mystery. Jill and her boyfriend Greg try to help Kyle track down his estranged mother. I enjoy seeing them mix sleuthing and pleasure on a weekend getaway before the Mother’s Day meal Jill has begun to dread. Kyle’s story takes an unexpected twist that I wasn’t expecting but really enjoyed. Jill is a complicated main character. I like her intelligence and business sense and her loyalty to her friends. She has a great match in her boyfriend Greg King, who is a police detective in South Cove. They have great chemistry and get along well. Jill has her reasons, but I am sometimes frustrated by her hesitation to make a commitment to Greg. After the family meal with him, I’m hoping things improve on that front. However, Jill mentions apprehensions about an upcoming gathering with her family that looks like it could cause future complications. This entertaining, fast-paced novella is a great addition to this enjoyable series.